Permaculture is based on the principles of ecology – the principles which make ecosystems function in a self-sustaining and productive way can be transferred to our own systems. If we design our human habitats to these principles we too can create not just sustainable, but abundant and thriving systems. When it comes to food growing systems permaculture gardens and farms use methods like no-dig raised beds, mulches and polycultures. These can easily be adopted without having completed a full permaculture design course. In fact, there is limited time available on a PDC to go into great detail about food growing practices, and students are often keen to get more hands on practice and advice. This is what led me to create our new course, Permaculture Gardening: Seed to Table. Growing food is one of the most fulfilling and positive actions we can take when aiming to be ‘a part of the solution, not a part of the problem’. Our current centralised food distribution systems are hugely energy intensive, they often rely heavily on chemical fertilisers, herbicides and pesticides and are therefore damaging to our health and the environment. Even if we buy organic food we are often eating vegetables that have travelled many miles and are far from fresh. Industrial scale agriculture requires many damaging inputs and creates many damaging outputs, so the more we can support small scale local growers, or ideally grow our own food, the better. Beyond this, growing our own food is empowering. Food is so vital that to be able to feed ourselves with good nutritious toxin-free food is a big step in taking control of our health and well-being. It was recently reported that a scientific study had found evidence that when our skin comes in to contact with the soil, ‘feel-good’ brain chemicals are released. Those of us who enjoy gardening already knew that! One thing which is not so good for the body or the soil is digging. Having started out as a veg grower on heavy Devon clay soil I can vouch for that! It is very rare to see bare soil in nature, and it doesn’t stay bare for long. The soil organisms which keep a soil fertile need to be protected and supplied with organic matter from the soil surface. For these reasons it is best to avoid digging where possible, especially routine turning of the soil which damages soil life and breaks down the structure, leaving it vulnerable to erosion. Using surface mulches, especially organic materials, replicates nature and provides many benefits – less erosion, happier soil life, less water evaporation, increased fertility and no weeds. It’s a win-win situation! Raised beds make this kind of gardening much easier by having permanent growing areas that we don’t need to walk on. We just add organic matter to the top and the soil organisms do the rest. It is important to point out that ‘No Dig’ doesn’t mean that a garden tool should never enter the soil. Of course there are times when digging is necessary and helpful- root crops will need to be dug up for harvest, and very compacted soils will benefit from being dug until they are in a good enough condition to become naturally fertile. Many green fingered or green minded folk have experimented with growing vegetables, herbs and fruit for themselves and their families, it is something that anyone can do, certainly not rocket science (excuse the pun). 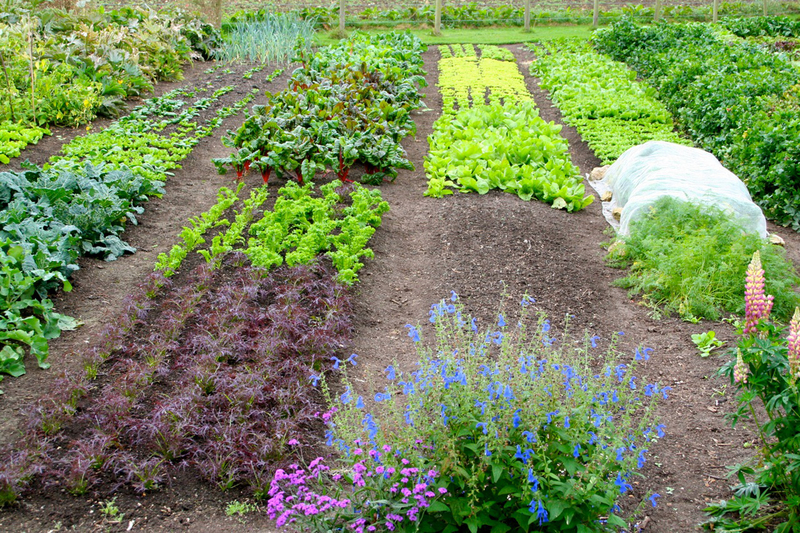 There are a few basic rules that we must follow, like crop rotation for example, to avoid a build-up of pests and diseases, and knowing when is the best time to sow, plant out, harvest and compost. The more you experiment and start to think holistically, the more flexible these rules can become, but for beginners it’s important to understand a little about how the garden works to avoid damage or disappointment! Having a good understanding of soil fertility and plant health will allow you to learn and grow with your garden. If you want to be really productive and are keen to produce a significant proportion of your own food you need to have a plan. You will need to think about your bed plans, crop rotation, polyculture guilds (combinations of plants to grow together), seasonal continuity, and the varieties which will work well in your soil and climate, and will extend your growing season. Sitting down and drawing up your plans for the season ahead is exciting and you will reap the rewards for doing so. Our new course will guide students through the gardener’s year, from bed lay outs, crop planning and designing polycultures, through to harvesting and storing produce and everything in between. This is also outlined in the Organic Horticulture module of The Land Course Online for those who prefer to study at home. In the last 40 years Permaculture has evolved into something we can apply to all areas of human life, but it began with growing food. When it comes to living a healthy, fulfilling and green lifestyle, growing food is a very good place to start. 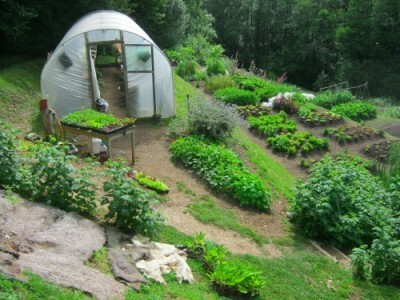 Our upcoming course, Permaculture Gardening: Seed to Table at High Heathercombe on Dartmoor 18th-22nd May 2016.